The following article by Jannalee Rosner appeared in the 27 June 2016 online edition of LDS Living.com. However, like any event in the media, there were multiple sides to every story. In fact, an article in the Herald of Freedom in Concord, New Hampshire stated, “. . .but I do not put the slightest confidence in the stories told of him by our political and religious presses. They tell as bad stories of the abolitionists as they do of Smith. They are not entitled to any credit. . . As to the Mormons, I would say here, that though I know nothing of their religion or character, I venture to guess they are both better—or at least as good, as those of the ruffians who killed them—or the other ruffians who virtually back them up in it” (pg 697). “Joe Smith is dead and gone. He was one of the most remarkable men of the age. The time for writing his history has not arrived. Men who have known him long and well, differ in their estimate of his character; the future historian alone can reconcile the contradictory statements of his friends and enemies, and place him in his true position. The personal manners of every man make him friends or enemies, regardless of his principles and of his conduct. This remark is clearly illustrated in the case of Smith. He was a man of rough exterior and course manners, thousands who approached him were so completely disgusted at once by his manners, that they refused to look at the good he claimed to have done. But notwithstanding this he was a remarkable man, and has left the impress of his genius upon the age in which he lived; he has carved out for himself a title to a page in the history of his country, and his name will be remembered, for good or for evil, when the names of half the ephemeral Statesmen of the age will be forgotten. . .
“He was a man of genuine courage, and would have fought to the last moment of his life. He was pursued by a band of three hundred infuriated demons and cruelly shot down like a wild beast, while confined in a small room where he could not escape. It was a glorious exit for him. Whatever there was of evil in his heart will be forgotten in the recollection of his death. He will be eulogized by his disciples, and worshiped as a God. Time and distance will embellish his life with new and rare virtues, and more than earthly power; his doctrines will flourish, his influence will extend to ages yet unborn, and future generations will celebrate his birth and death by public festivals, public prayers, and an unlimited devotion [signed] H. J.” (pg. 668-671, emphasis added). The news even spread in Europe. The Portland Transcript in Maine shared part of a story printed in the Liverpool Mercury: “The scenes which have taken place in Pennsylvania and Illinois would have disgraced a nation of savages. We question whether. . . any record can be found more sanguinary than the riots in Philadelphia, or the massacre of the Mormon leader and his brother, in the prison at Carthage” (pg. 661). Still others took a middle ground, denying Joseph’s standing as a prophet, but speaking out against his death in defense of a fair trial: “It will probably never be known who shot Joseph and Hyrum Smith—but their murder was a cold-blooded cowardly act, which will consign the perpetrators if discovered to merited infamy and disgrace. They have broken the pledges to the Government—disgraced themselves and the State to which they belong. They have crimsoned their perfidy with blood. . . It will long be regretted that things have taken the turn they have in relation to the Mormons” (Quincy Herald). The Lee County Democrat in Fort Madison, Iowa, added, “The murder of Jo Smith and his Brother has caused feelings of deep regret in the breasts of every peaceable and law-abiding people; they look upon it as a high-handed outrage, and as a cruel, cold-blooded, cowardly and contemptible murder. That Jo and his brother were guilty of acts which required the interposition of the law, we are well aware, but after he and his brother had voluntarily surrendered themselves up to justice, under the full assurance that they would receive the protection of Governor Ford from all violence; they were entitled to all protection against all danger and all enemies” (pg. 659). Though these are just a few of dozens of comments made about the death of the Prophet and his brother Hyrum, they show the wide range of influence the gospel of Jesus Christ, as restored by Joseph Smith, had and continues to have in the world. 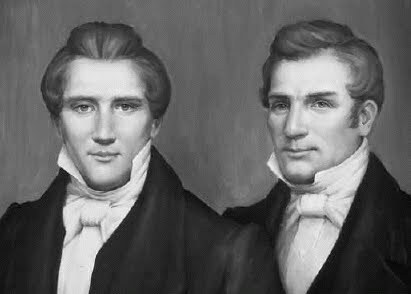 Despite the Church’s small numbers and the fact that most people did not believe that Joseph Smith was a prophet, many people knew who the Latter-day Saints were, and believed that the deaths of Joseph and Hyrum Smith were unjust. Statue of Joseph and Hyrum Smith on their way from Nauvoo, Illinois to the Carthage Jail. Located in front of the Nauvoo Illinois Temple. This 2003 sculpture is by Stanley J. Watts (human figures) and Kim Corpany (horses).